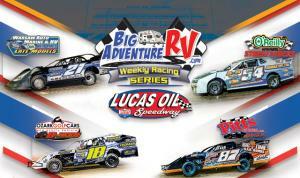 KY3 presents round #3 of the Lucas Oil Speedway Big Adventure RV Weekly Racing Series plus Lucas Oil Speedway will also be offering special $5 ticket prices for all Adults, Seniors, and Youth, and Kids 5 and under are FREE. We will be running a complete Big Adventure RV Weekly Series event featuring the Warsaw Auto Marine and RV ULMA Late Models, the Pitts Homes USRA Modifieds, the O'reilly Auto Parts Street Stocks, and the Ozark Golf Cars USRA B-Mods. The Modifieds, the O'reilly Auto Parts Street Stocks, and the Ozark Golf Cars USRA B-Mods. The O'reilly Auto Parts Street Stocks will be running a special 25 Lap $750 to win Main Event. Gates open at 4:00 Hot Laps at 6:30, and racing at 7:05.